For years, homeowners have aspired to the stylish elegance of shutters. They are one of the most versatile and enduring ways to dress up a home. But in the past, shutters have been tough to order, tricky to install and far from affordable. That is, until Norman Shutters. Norman Shutters delivers shutters of beauty, quality and value to over one-half million windows per year around the world. No two windows are alike. And every customer has different functional and design needs. That’s why we’re always innovating at Norman Shutters. We continuously develop and patent new shutter improvements and streamline processes to enhance manufacturing, ordering efficiency, installation, aesthetics and long-term performance. It takes the latest and greatest to exceed industry standards — and yours. 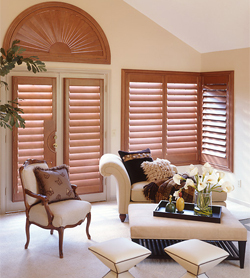 Homeowners are immediately impressed by our shutters’ burnished, furniture-smooth finish and brilliance. Yet beauty is more than skin deep. Quality is built in from the core of our premium hardwood and composite shutters to the construction-site strength of our mortise and tenon joinery. Even our internal fasteners are stainless steel, and rustproof! We test our shutters for color consistency, color fastness, heat and moisture endurance, joint strength, package durability and more. All of this ensures a flawless look and long-lasting performance. To ensure your total satisfaction, we stand behind our shutters with a lifetime limited warranty on materials and workmanship. Norman Shutters updates the centuries-old craft of making shutters in our award-winning manufacturing facility. This 1.5 million square-foot, state-of-the-art plant is dedicated to handcrafting shutters – and bringing the best to your home.